The X-ray emitting gas that resides in clusters of galaxies has a revealing story to tell. This gas is important since it actually contains most of the normal matter in the cluster, more than the combined matter contained in the individual cluster galaxies. It is also an important reservoir of the history of major cluster events, if revealed by careful, painstaking analysis. 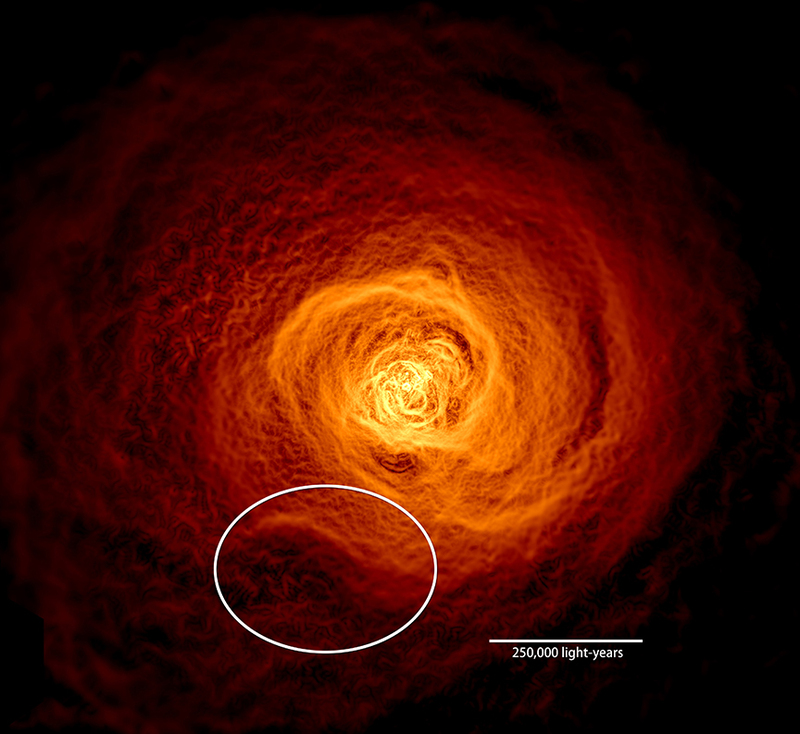 A fine example is shown in the image above, a deep (10.4 day) X-ray exposure of the famous Perseus cluster. This image, obtained by the Chandra X-ray Observatory, has been digitally enhanced to highlight bright, billowing wave crests in the X-ray emitting gas. Astronomers believe the waves were stirred up by a near collision with a small galaxy cluster which passed Perseus a few billion years ago, creating the intricate structures revealed in the Chandra X-ray image. An unusual, bright edge stretching a quarter million lightyears can be seen towards the lower left of the image. Comparison of this structure with detailed simulations shows how the gravitational interaction produced by the near-collision sets up sloshing motions in the intra-cluster gas and also reveals important information about the pressure of the gas and the strength of the magnetic field threading through the cluster.